Ford V10 HP and Trans in Class C?? I know the older ford v10s had around 310 horsepower and a 4 speed trans. When did they switch to a higher horsepower, and when did they switch to a 5 speed trans?? That may be different years, and not sure if they ever raised the horsepower. This thread was moved from the Class C Forum by Staff. This is noteworthy since the F53 Class A Chassis had a V10 with a different HP/Torque rating due to 3 valve heads. The Class C Cab/Chassis reportedly did not have this upgrade. The F53 chassis currently has a 320hp three-valve V10. The E350 and E450 cutaway chassis can only accommodate the two-valve V10 due to the limited distance between the shock towers; the three-valve V10 is too wide to fit. The V10 in the E-Series is the 2-valve SOHC, with 305 hp and 420 lb·ft ratings for 2000 and later model years. Ford introduced the 5R110W TorqShift 5-speed automatic with the 2005 models. Here is a writeup of the Ford modular engines. I need to be very clear that I am no expert on this. My comments are based on some personal research and some on knowledge shared on various RV forums. If shopping for a used Ford E350 or E450 motor home, especially if on a fairly tight budget, you'll want to know the cut-offs for engine and transmission changes. But to state up front, an old 1998 E350/E450 with the first V10 is not one to toss to the curb. If the low price fits your budget right, and the rig is just right, don't rule it out. If you want to completely avoid the "spark plug pop-out" issue, and get a 5 speed Torq-Shift transmission, I think a 2006 (maybe even a 2005) will get you both. I own a 2007 E350 which has both. It also has the enhanced external transmission filtration system that was dropped the following year 2008. But the newer the model year, the better the E350/E450 will be. There is a lot that kept getting better, not just with the engine and transmission, but also with the chassis. The technology in a 2018 transmission is better than in a 2008. It behaves better and is more fuel efficient. 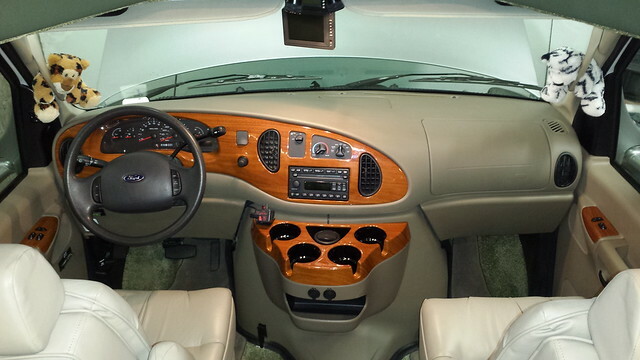 If I were to shop for a used motor home today on a Ford E350/E450, I would feel better with a 2009 than a 2008 or older because 2009 is the first year of the current-day dash board which has the 12V outlets in better places, and you also get a glove box. But the appeal of our earlier dash design is more domesticated with a better view, not a tall wall and industrial looking. That is surely a matter of personal taste. Here is our 2007 E350 dash board. Here is a current day E350/E450 dash board. Its looks identical to my old 1999 E450 class C MH. 4 speed trans, V10, with 50,000 miles. No spark plug popping. Ran strong right up to trade In day. Now have a 2017 class A?, Thor Axis, on a E450 chassis. The newer V10 and 6 speed make a world of difference. It also has the enhanced external transmission filtration system that was dropped the following year 2008. The enhanced filtration on the 5R110W was introduced as a running change during the 2008 model year. No 2007 vehicle had it. Former Ford automatic transmission engineer. Hey Ron--what seats were in your 2007? Aftermarket? I hear over and over that the latest 6 speed trans feels right. We have the 2007 5 speed and it feels like it could use another gear in there somewhere......under certain conditions. My 2007 has a trans filter in the pan and an extra external bell jar style trans filter. The cartage looks like a small roll of toilet paper. I think it was discontinued the following production year....maybe mid year to coincide with your data. They were installed by the RV manufacture. Yes, that is correct. The poorer performing external filter was replaced by an internal filter that is FAR superior to that small external cartridge filter. We're getting caught up in terminology - you call the older system superior, I call the newer system superior. Mark, can the newer, more efficient in pan filters, be retrofitted to the older transmissions, like the 4 and 5 speed?